When you hear the phrase 'Victorian England', a certain image springs to mind. I'm almost certain that for most people, it would not involve an enigmatic enquiry agent and his assistant dealing with mysterious happenings in the Chinese section of Limehouse in London. Enquiry agent Cyrus Barker had a Chinese assistant, Quong, who was murdered a year earlier. Determining who killed Quong has been a matter of importance to him ever since. He has hired a new assistant, Thomas Llewelyn, who serves as the narrator for this story. While looking over Quong's effect, the police find a pawn ticket in his sleeve, which they give to Barker. The pawn shop turns over a rather ordinary-looking Chinese book. Barker recognizes it almost instantly as a very important and rare artefact that was stolen from a Chinese monastery. The book reveals martial arts secrets, including lethal techniques that can be used to kill a man without a sign. Obviously, if this book were to fall into the wrong hands, disaster would ensue. Barker hides the book, but interest around it is high, from both sides of the law. Several people are killed; in a surprising twist, it appears that someone has used one of the techniques from the book to try to kill Barker. THE LIMEHOUSE TEXT was a pleasant read, with nothing very much out of the ordinary other than the sense of being very involved in an Asian adventure. Thomas's greatest strength is in creating memorable characters. I particularly liked the character of Thomas Llewelyn, who was somewhat naive with a quirky sense of humor. Cyrus Barker, the nominal lead in the book, didn't really come to life for me -- in many ways, he exhibited the Energizer Bunny syndrome of modern-day detectives where he kept going despite being grievously injured. Certainly, Barker is a mystery to all who know him, and Llewelyn is delighted at every new revelation about his employer. The conclusion of the book is straight out of Agatha Christie, with all the suspects gathered in one place with Barker alighting on the perpetrator, followed by far too much exposition on how the crimes were carried out. 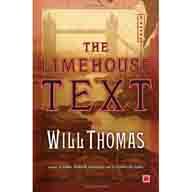 Overall, I find myself less than enthusiastic about THE LIMEHOUSE TEXT, in spite of some appealing elements. Fans of Arthur Conan Doyle will likely enjoy this series.